It’s been 3 weeks since I came out to Arizona, and so far it’s been a pretty fun adventure. This week had a lot of smaller adventures, as well as some unexpected surprises. This week started the Olympics at work, and the first event was a volleyball tournament. We won our first game, and ended up taking 4th overall in the tournament. It was a lot of fun getting to play again, and it was really great getting to spend time with more people at lunch. I also managed to find the window rock this week that I had tried to find the first week. I went with one of my friends after work, and she led the way. I will say though, we were not really following a trail and there definitely weren’t signs, so I don’t think I would have been able to find it without her. It was neat getting to see the view from the window rock, and the hike was much shorter than the one I had attempted trying to find it the first week. Over the weekend I went to Amarillo to get my car back (I had been using my mom’s the first few weeks). 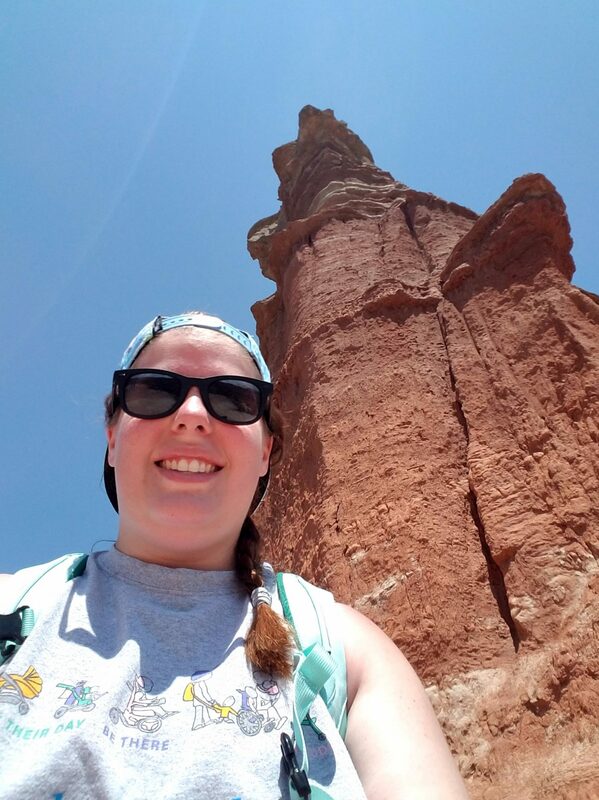 Since I was in Amarillo, I decided to visit Palo Duro Canyon. I hiked the lighthouse trail inside the canyon that is a 2.7 mile hike on the trail, followed by maybe another .25 miles off the trail to get up to the lighthouse rock. The trail is an out and back trail, so in total it was about a six mile hike. The canyon is beautiful, and the trail was a pretty flat well defined walk along the bottom with every .1 mile marked, so I got to see a lot of the canyon while on the hike. The lighthouse rock is the feature that the canyon is best known for, and it looked like the only way to see it was to do the hike, there were no overlooks that would allow you to see it. From the end of the trail up to the lighthouse was definitely a more difficult climb. It was pretty much straight up, and I had to take several breaks along the way. From the end of the trail, you can’t actually see the lighthouse, so unless you climb up, the last view of the lighthouse is at about the 2.5 mile mark. Overall it took about 3 hours to complete the hike, and the views near the lighthouse rock were absolutely spectacular. The park cost $5 for a day pass, and I probably could have seen more than just the lighthouse trail, but I was pretty worn out from the hike and short on time. The hike and views were still amazing and definitely worth the $5 for just the lighthouse trail and stopping at a few overlooks on the way out. 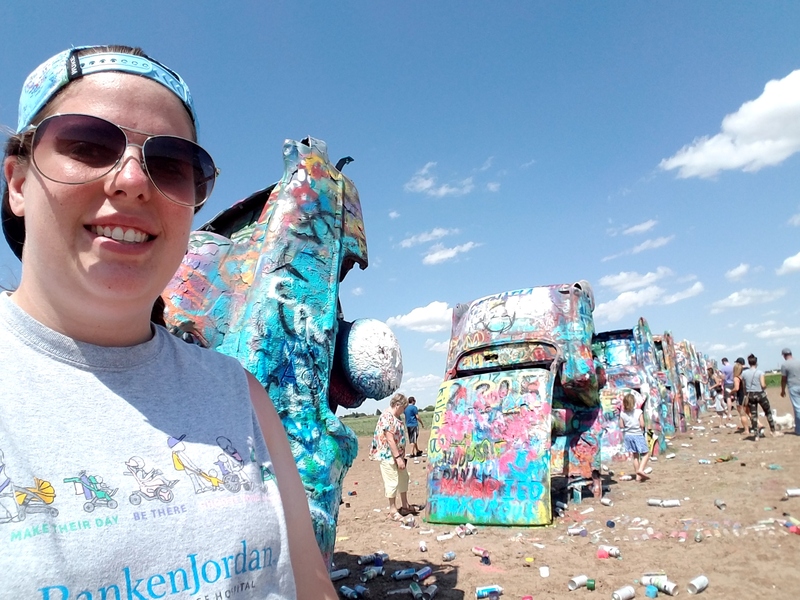 While I was in Amarillo, I also stopped at Cadillac Ranch because I had not been before. It was a nice quick stop, and I was ready to drive back to Arizona, but some unexpected adventures happened. After Cadillac Ranch, my car wouldn’t start. I finally got it to start, but had to head back to Amarillo to get it checked out before starting my drive back to Arizona. Luckily, it was just that the battery cables needed to be tightened, so I was able to get on my way pretty quickly. My temperature gauge had been running a little high, but I was planning on waiting until I got to Arizona to get that checked out because it wasn’t causing any problems that morning. On the drive, the temperature gauge stayed a little high, and the AC would not come on because of it, so it was a pretty hot drive. I stopped for gas at a small station that did not even have bathrooms, and when I went to turn my car back on, the temperature gauge was all the way on high so I pulled to the side and was just going to wait it out. A kind stranger with Oklahoma State plates came over and offered to help. He checked a few things, and got my car working again. With the temp gauge back where it was supposed to be and the AC working again, I hit the road again. It started to get a little bit windy, and the sky was looking pretty dark once I got driving again, but I didn’t think much of it until I saw a sign saying that the highway was closed ahead. I pulled of in Santa Rosa to see if I could wait it out. With all of the delays I had already had and looking at the weather, I decided to stay the night in Santa Rosa. I had to try 3 different hotels before I found one with a room, but it was well worth the rest after the long day I had had. Sunday brought better luck. I left Santa Rosa and drove back to Arizona without any troubles. On Sunday evening, I went to the carnival that is in town. I ate some carnival food, and won a prize at one of the games. I had forgotten how expensive carnivals are, but it was still pretty fun getting to go for a little while. Even with the unexpected turns this week, I still really enjoyed the adventures I got to go on this week.